I genuinely hope EVERY SINGLE ETSY SELLER listens to this episode. If you are an Etsy seller, and you know other Etsy sellers, please share the link to this episode with them. 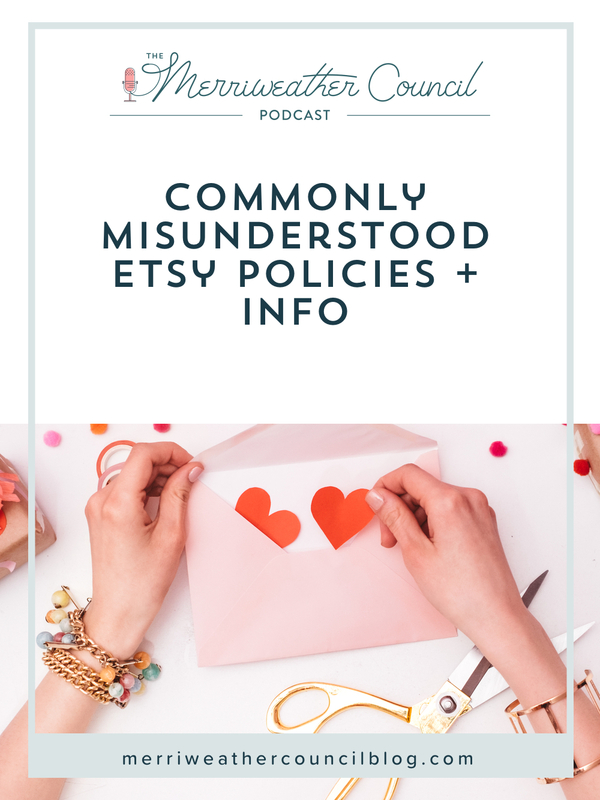 There are so so many misunderstood Etsy policies, but I’ve chosen a few to cover in this episode. I could make several episodes that cover misunderstood Etsy policies, but hopefully one is enough to drive home to point: always fact check. Reading policies anywhere can be dry and boring, I get that. But if you EVER have a question about a policy, it’s usually best to go straight to the source for the answer. Listen for all the details on these and to get the real facts once and for all. Next time you see someone ask about any of these in a group, share a link to this episode with them. Go on and get empowered now! For your reference, you can always find the Etsy seller policies here and more about fees and how they were here. Great advice and good reminders about the fees, etc. Now that I have found the Merriweather Council site and podcast, I do not listen, read or follow anyone else giving Etsy tips, suggestions or advice. Danielle, you are my go-to expert for everything Etsy!!! Thank you for the on-point information and little bits of tough love.